I decided to ink up one of the new Taylored Expressions sets that I haven't had a chance to play with yet called Hugs & Kisses with coordinating die~LOVE IT!!! The layout I used is this week's Deconstructed Sketch #84 which is a fabulous layout! I can't wait to use it again. We hope you'll play along with us this week. 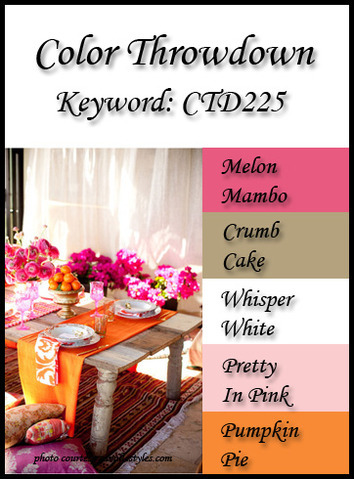 Just link your projects to the Color Throwdown Blog and while you're there, make sure you check out the rest of the amazing DT creations. Thank you so much for stopping by today:) I hope you have a wonderful Wednesday! OMG I love this card Kerri!! Fabulous, Kerri! Those hearts in the jar are adorable! Wonderful card! So sweet and I love those sparkly hearts! Too cute Kerri! You rocked these colors! Awesome colors this week, Kerri, and I LOVE your card. Really pretty papers and I love all the sparkle on the hearts. 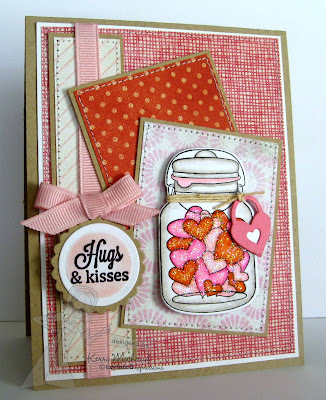 This is sooo cute, Kerri...I just love that adorable jar loaded with sparkly hearts!!! Looks like I need to go shopping at TE!!! These were great colors to work with, Kerri! Your jar of treats is adorable! I really like these color you picked for this week. Your card is so cute. The hearts inside of the jar look yummy!! This is a great color combo, Kerri, and I just love your little jar of sparkly hearts! That heart lock is pretty awesome too! Awesome colors this week Kerri! Love your adorable card with the jar full of glittery hearts!